I will share my continued fascination with First Nations art by showing you a new addition to our digital collection of images. 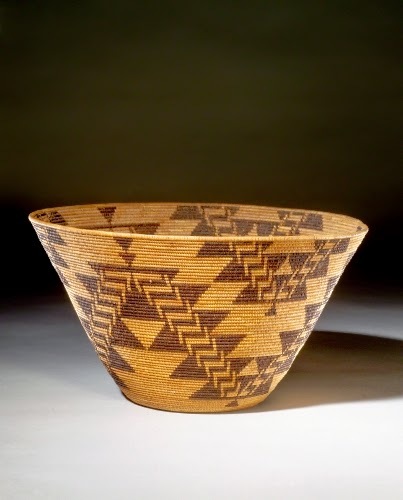 Basketry is a prominent art form in all indigenous American cultures since the earliest times, but it was particularly elevated in sophistication in the First Nations of California. 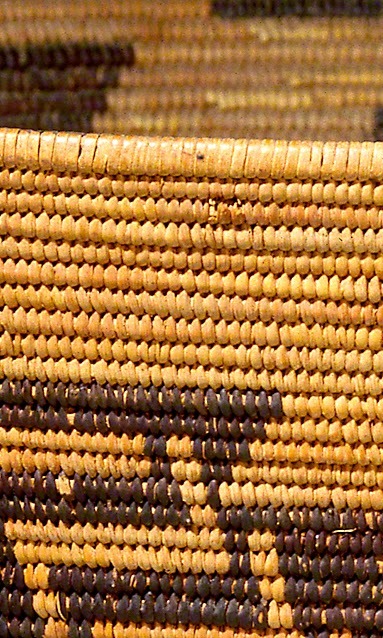 Although Pomo culture baskets decorated with feathers are most often the objects discussed when talking about California basket artists, there are numerous cultures that populated California in great numbers before the Spanish / Anglo “colonization.” The Maidu are one of them. The Maidu are a people whose homelands extend roughly from the southernmost reaches of the Cascade Mountain Range to the north, the crest of the Sierra Nevada to the east, the North Fork of the Consumes River to the south, and to the Sacramento River to the west. “Maidu” is a word that means “people” in their own language. Mary Kea’a’ala Azbill, of Chico, California, was of Coyongcauy, Maidu, and Hawaiian descent. She travelled several times to Hawaii, settling permanently in California in 1894. Her mother, Alvin Sow-with-kee-neh was from the village of Taiyum Koyo, where Mary was born. Her father, Iona Kea’a’ala, was Hawaiian. From the 1870s on, Azbill became renowned for her sophisticated basket art. She developed her mature style at the time in the late 1800s when there was a growing demand for Native arts, which included baskets, textiles, Katsina figures, beadwork, and ceramics. Studio activity: Make a coiled basket. Use a clothesline along with yarn threaded into a plastic needle. Wrap the rope with yarn in spirals, and form into a circle. Thread yarn over and under to sew the coils together. To create interest, use yarn of different colors.